Having a collection is a whole lot of fun. There’s always something new to look for, an exciting new addition to be added. The only problem for true collectors is having the room to show off all of their awesome collectibles. Sometimes there just isn’t enough room – and that’s okay! – as long as you make sure you’re storing your extras as safely and securely as possible. Storing comic books isn’t as simple as throwing them in a drawer, especially if you have a few especially valuable issues that you want preserved properly (Detective Comics #27, anybody?). First, make sure each of your individual issues is placed in a mylar sleeve with a backing board. Mylar isn’t necessary, but it’s the best sleeve for long term protection. Next, store your comics upright in long boxes in a cool, dry, dark location with consistent temperature and humidity. Make sure these cardboard boxes aren’t stored in the basement or anywhere where they can end up damaged by water or pests – a great choice for keeping them safe is storing them in a temperature controlled storage unit. In a safe, dry place, your mint condition comics will become more and more valuable as time passes. You can’t just toss your fine china in some newspaper-stuffed cardboard boxes and forget about it. Obviously, you should wrap everything up and your best option for that is bubblewrap. You can use blank paper as well; avoid newspaper, because it leaves a lot of residue behind. After wrapping, use cardboard dividers and store all bowls and plates on their sides. Remember, the edges are stronger than centers on most fine china. Simple precautions like these should not only keep your fine china stored safely, they’ll also help prevent damage. 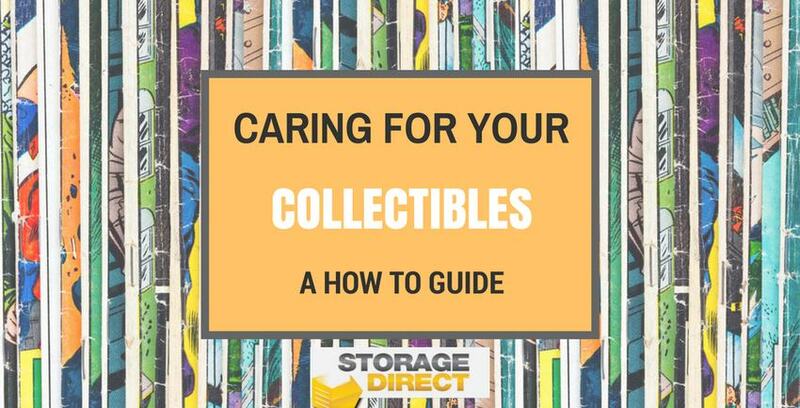 The art of storing collectible coins is surprisingly detailed, but we’ve got the important basics for you here. The first and easiest way to store coins is by putting them in mylar holders. Mylar is clear and allows you to pull out your coins without damaging them with fingerprints and the like. Your other option is using a coin folder and album – easily purchased – to store them safely in cardboard or plastic bins. Any long-term coin collector should consider folders and albums. Storing action figures can be a hassle because of their irregular shapes and small, loose pieces. The best way to safely store parts of your action figure collection is to put each individual figure in labeled, gallon-sized ziploc bags so their pieces don’t get separated. After that you’re going to want to store them in snap-shut plastic containers. They’re the best solution for keeping out light, moisture, and any potential pests. Storage units are a great solution for people looking to store parts of their beloved collections. With environments that are a lot more controlled than your average basement, Storage Direct has the storage unit solutions you need to store your most special things as safely and securely as possible.